Come for a walk on a glacier, we'll soon have you taking your first steps with a pair of crampons on your feet. 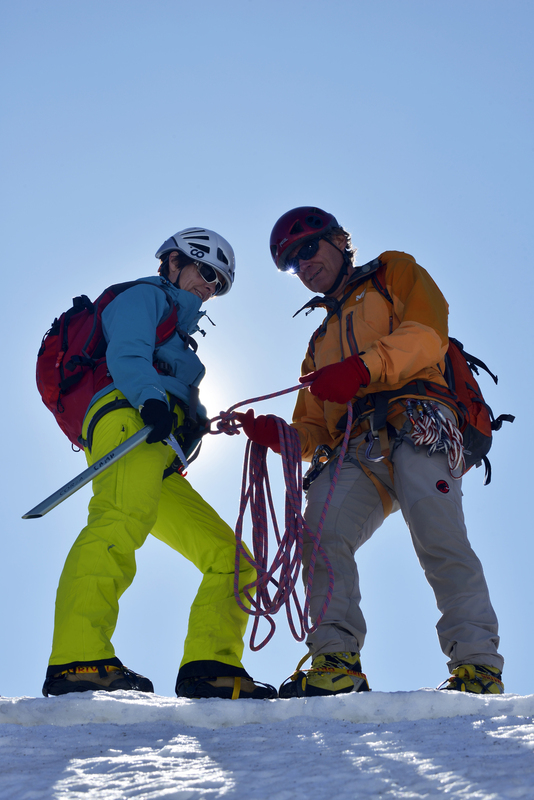 You will discover how to use a piolet (an ice axe). You will then be roped to your guide, ready for stroll on the back of this icy monster. Your high-mountain guide will take you close to crevasses, you will unveil the mysteries of the origins of water. An excursion into the high mountains for about four hours of quiet walking. A good pair of hiking shoes is essential (possibility of rental). All other technical material is provided. A fantastic time enjoying a fun activity in a cocktail of waterfalls, slides, jumps and abseils, equipped with neoprene suit and harness. Via Ferrata in Tarentaise "Vertiginous Walkways"
The Via Ferrata is a unique experience to share with family or friends.Your guide will give you the keys you need to progress safely along these vertiginous routes equipped with cables and metal ladders.